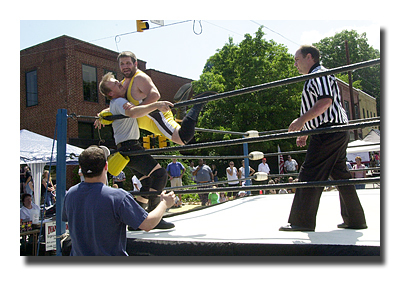 I saw something today that I have never witnessed in person before....a pro-wrestling match held smack in the middle of King Street in the mega-metropolis of Boone. Yep, there I was minding everyone else's business, taking photos of the Rat Daddy Bike Fest when I noticed one kinda big guy in a much too tight outfit and then I saw a rail thin balding gentlemen all in black. They entered a ring and began to wrestle. I was more than curious and watched as the crowd gathered about and cheered their favorite. Now I could tell that this was a fight to the death and that these boys were seriously gonna put some hurt on each other. The crowd got rowdier and little kids even joined in the taunts. "Kill 'em Big Earl" some 6 year old screamed beside me. I watched for a little while, laughing the whole time. It was surreal watching a couple adults run around a ring, fake fighting, while the rest of us stood around, fake yelling. One thing was for sure....it was entertaining and I still haven't figured out that one yet.